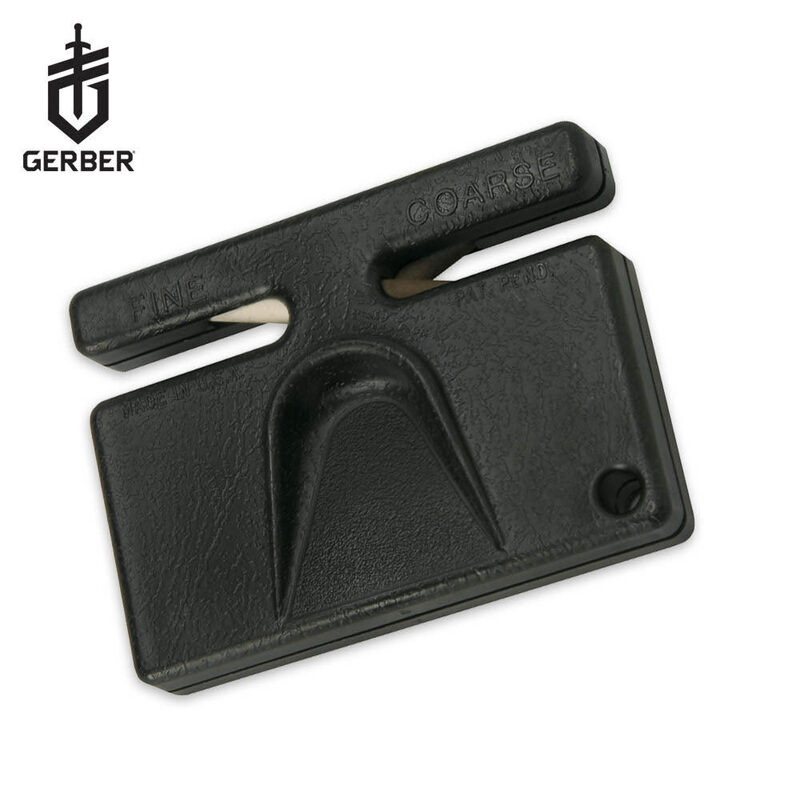 Gerber Knife Sharpener | BUDK.com - Knives & Swords At The Lowest Prices! This mini pocket sharpener will produce a razor sharp edge every time! The 3" base is equipped with an easy to grip handle and pre-set ceramic sharpening rods for a super sharp edge! 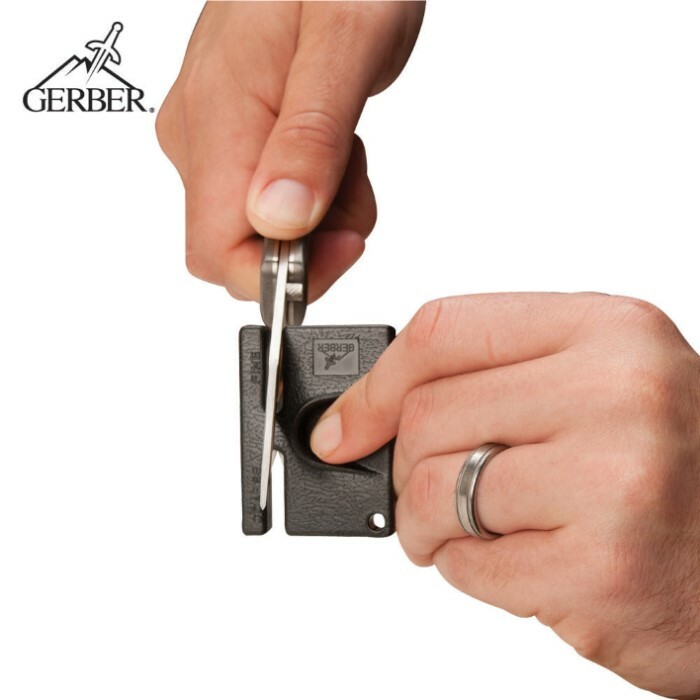 This pocket sharpener offers the operation of a large sharpener with the compact design of a pocket knife! it Sharpens the knife it doesn't put on a razor sharp edge but it will do. works ok , ceramic rods were a bit loose but does the job. Good for toolbox/tacklebox. This is by far the best sharpener ive ever owned. Especially for the price. Its small an extremely easy to use. This is a good sharpener, but better for touching up a sharp blade, rather than sharpening a dull one. The sharpening implements are crossed ceramic rods, the "coarse" side being aligned at a more obtuse angle than the "fine" side, giving a great shouldered edge. I`ve used this to touch up a few blades of my own, and have made them sharp enough to shave with. Great to keep on a keychain. Excellent touching-up item. It is a very nice sharpener for your pocket knives, though I wouldn't recommend it for some large fixed blade knives as the slots for the sharpeners are small and you cant stick the blade through all the way, you also can't use it on serrated blades, but other than that it is an excellent pocket knife sharpener and I use mine all the time. This knife sharpener works well for the occasional touch-up. I would not recommend this to be your main knife sharpener, but if you need to sharpen your tool outside of your home, this is definitely a good buy. Nice, small, lightweight sharpener... carry it anywhere. Will not take a really badly damaged blade to a razor sharp tool, but if you have a nice knife that needs occasional sharpening in the field. At this price, buy one for home, truck, bug-out bag, pocket, backpack, wallet, spare magazine holder, ankle holster .......... Editor's Note: Thank you for your comments. We have updated the review to reflect the appropriate spelling. good item. I think that this item makes blade sharpening a little awkward, meaning that since there's so little friction material in this pocket-sharpener it takes a while to notice any actual improvement in the blade's sharpness.